After winning Hollands Got Talent in 2013, the young Amira has released two CDs of her own, and appeared on a number of concert DVDs and double CDs. Besides being available in various shops in mainly The Netherlands and South Africa, and online via shops such as Amazon and iTunes, Amira’s own charity organization Stichting Gelukskinders sells these media and ships worldwide. With the revenue of the sold media, Gelukskinders works to realize Amira’s dream: building playgrounds for less fortunate children in South Africa. 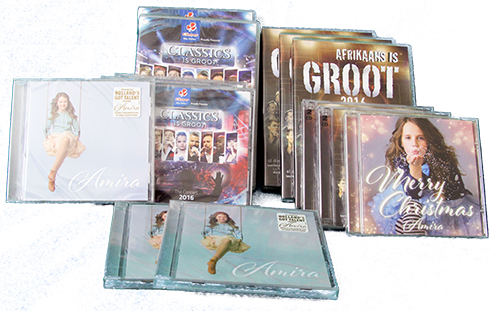 Click on a title below to listen to samples of Amira’s songs.